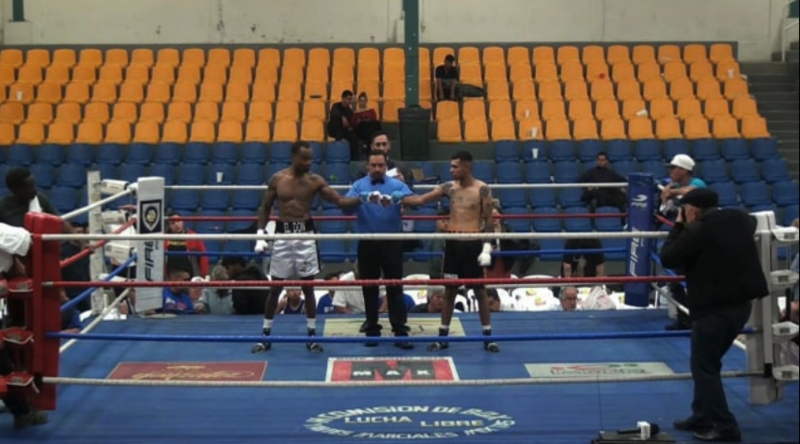 The unexpected happened Saturday night in the coastal resort town of Rosarito, Baja California, Mexico with boxing fans treated to one surprise stoppage after another with four combatants ending up on their back. 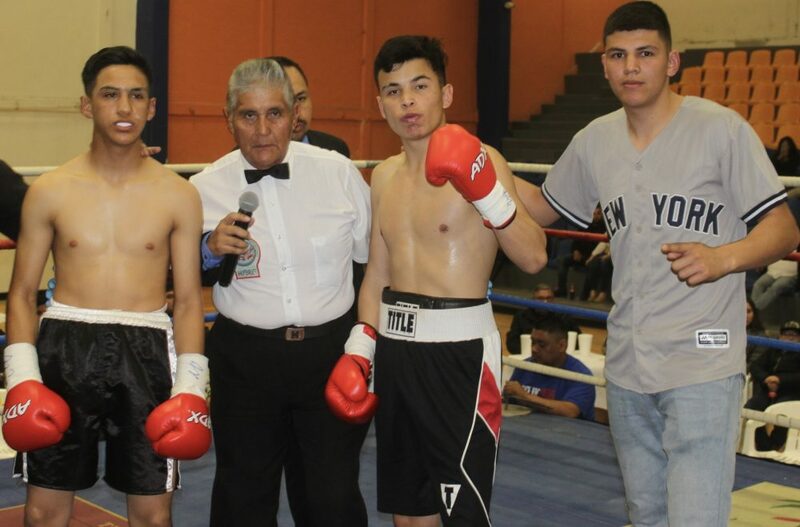 The show put on by Velazquez Boxing, Cruz Sports Entertainment and MacPherson Boxing began at 8 p.m. and ran well passed midnight at the Auditorio Rufo Appel. All the while, Boxing fans were delighted to be sitting next to or very close to one of the many Boxing celebrities. 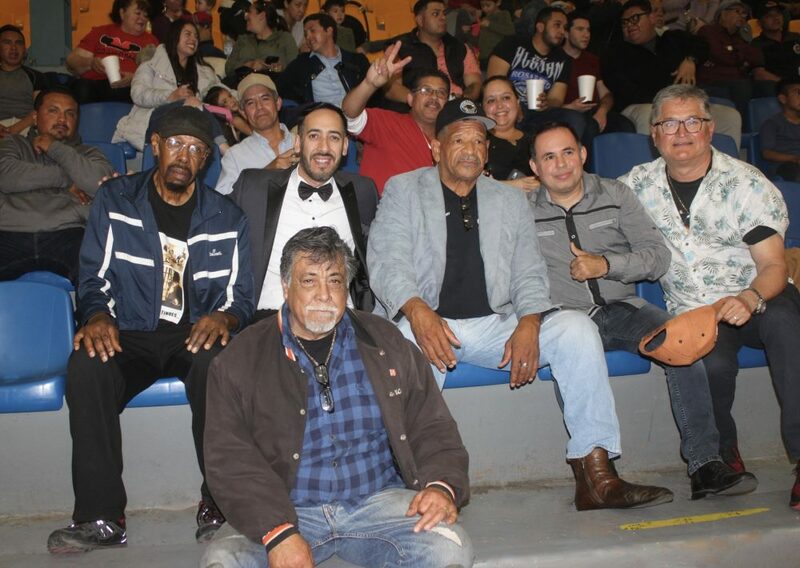 On hand to see the show were many special guests to include boxing legends Yori Boy Campas (107-17, 3 with 89 KOs) (left) the former IBF Super Welterweight champion who fought such boxing greats as Felix Trinidad, John Duddy, Raul Marquez, Fernando Vargas, Oscar De La Hoya and Hector Macho Camacho and to his right you’ll see welterweight Humberto “The Crafty Little Fox” Soto (69-9-2, 37 KOs) who is now scheduled to face Jessie Vargas at the Forum in Inglewood, Calif. on April 26. Soto is certainly no slouch. 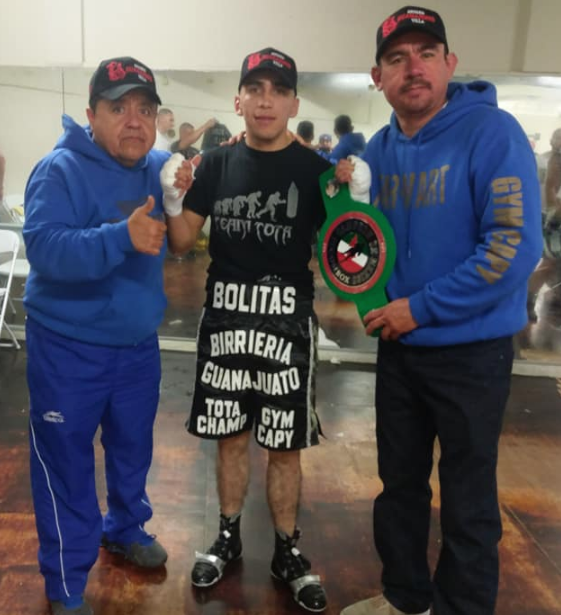 He’s battled the likes of Brandon Rios, Lucas Martin Matthysse, David Diaz, Joan Guzman, Jorge Solis, Gamaliel Diaz and San Diego’s Antonio Orozco. 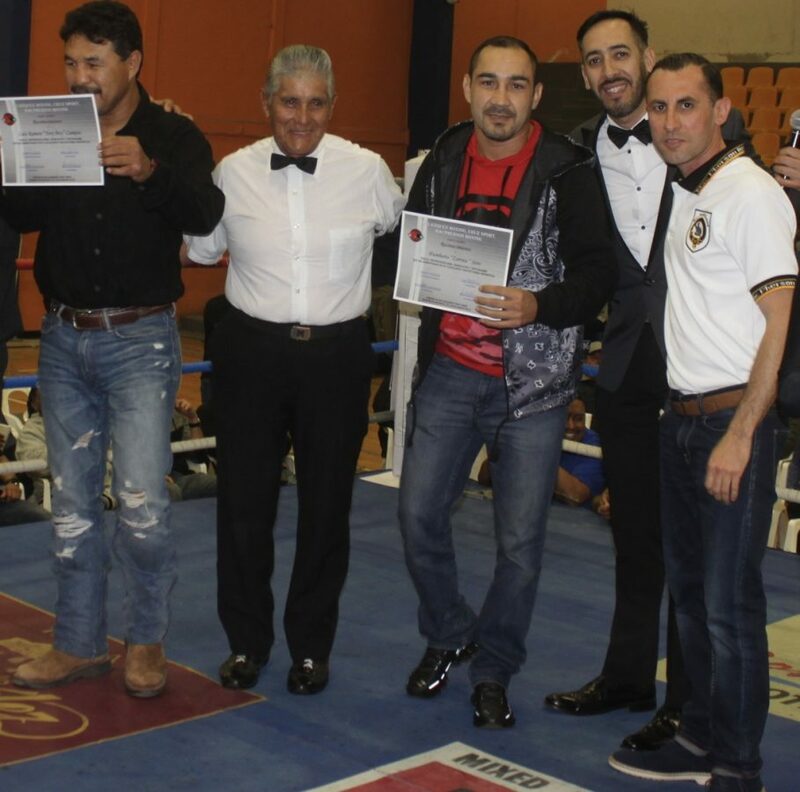 Also in our photo is veteran referee Juan Manuel Rincon, prominent ring announcer Pablo Flores plus one of the show’s lead sponsors Francisco MacPherson. How many of these distinguished gentlemen can you name? (l to r) We have Art Wilson, the City of San Diego Registrar for USA Amateur Boxing plus head boxing coach at the center city ABC Mongoose Gym. Next, there’s Pablo Flores ring announcer extraordinaire, then Billy Moore, son of the legendary boxer Archie Moore, then you have promoter Saul Rios of Borizteca Boxing Promotions. At the close of 2018, he was selected Top Boxing Promoter by the World Boxing Federation. 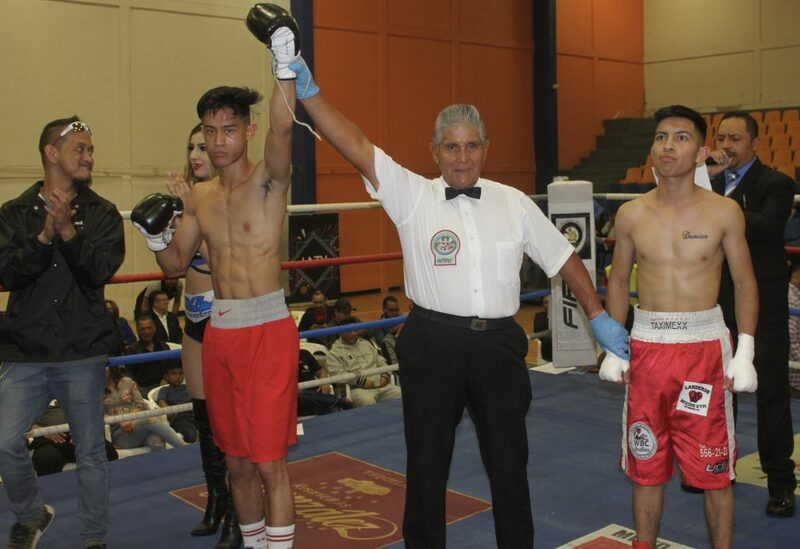 At the conclusion of Bout #1, Ramon Valenzuela Global ID 876325 from Nacozari de Gracia, Sonora, Mexico has his arm raised in victory after defeating Ramon Martinez (l) Global ID 876320 from Oxnard, Calif. by TKO at the 1:06 mark of round three. 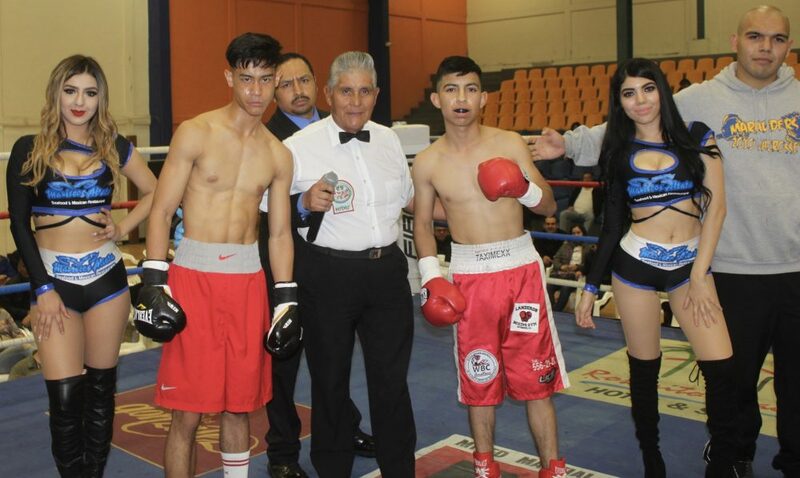 In what has to be considered an upset, 18-year-old Ramon Valenzuela (r) from Nacozari de Garcia, Sonora, Mexico registered a 3rd round TKO victory over the 142 lb. Ramon Martinez from Oxnard, Calif. Both men were making their Pro Debuts. 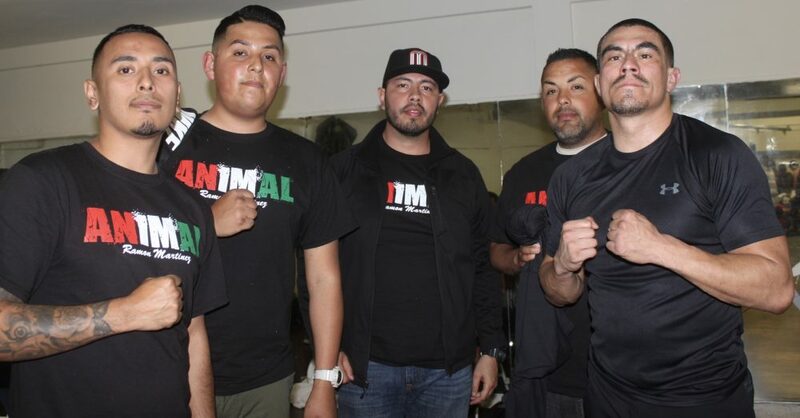 Following his loss to Valenzuela, the naturally upset Ramon “The Animal” Martinez rushed from the ring and returned to the dressing area. Explaining our need to have a photo taken, Martinez (right) and his entourage courteously posed for this photo. Before the start of Bout #2, the boxers, both 18-year-olds and both featherweights making their Pro debut, Ricardo Urias, Global ID 872547, 123.5 lbs. 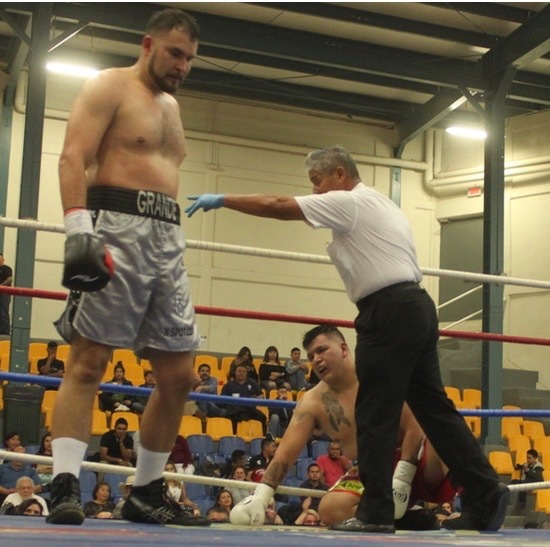 (l) from Rosarito (red corner) and Raul Vasquez Global ID 872548, 126 lbs. (r) from Agua Prieta, Sonora, Mexico (blue corner) received their final instructions. 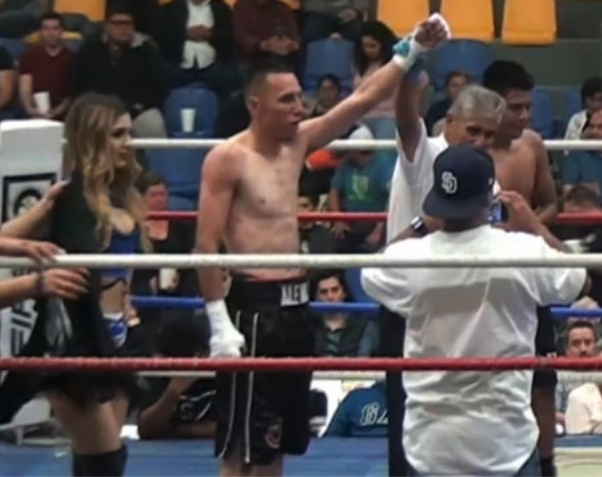 In this one, it was Urias coming away with the first round TKO victory over the less polished Vazquez. Ricardo Urias (now 1-0) is all smiles as his arm is raised after defeating fellow debutant Raul Vazquez (0-1) with an early stoppage, 1:36 mark of round #1. As soon as the stoppage was called, Raul Vazquez, now (0-1), could not have gotten out of that ring any faster. We had to chase him down in order to get this important photo. Bout #3, a super flyweight contest, featured Jessie “Super” Mandapat (left) (1-0), from Anaheim, Calif., Global ID 861001, taking on a 20-year-old by the name of Julio Cesar Gil Diaz (r) (0-3) from Mexicali, B. C., Mexico, Global ID 854586. With his dominant victory, Mandapat (l) improved to 2-0, 2 KOs while Diaz dropped to 0-4, a victim of four straight stoppages. In Bout #4, a super lightweight contest, it was 28-year-old Sergio Hernandez Cabrera (black trunks) Global ID 848553, weighing 140 lbs., from Playas de Rosarito, B. C., Mexico improving his record to (2-1-1) by defeating 31-year-old Francisco “Panchito” Aguilar now (5-22-1, 3 KOs) Global ID 060670 from Agua Prieta, Sonora, Mexico who weighed in at 139 lbs. 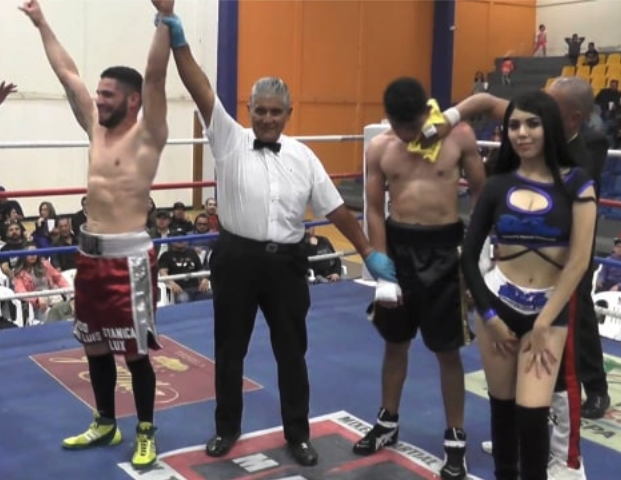 By the third round Cabrera had his opponent worn down and the referee, Juan Manuel Rincon, had no other recourse but to step in and call a halt to this onesided affair. At the 41 second mark of Bout #5, 39-year-old middleweight Rodolfo “Osama” Manriquez, Global ID 291406, was dropped by a Desmond Horne left hook and went straight to the canvas. 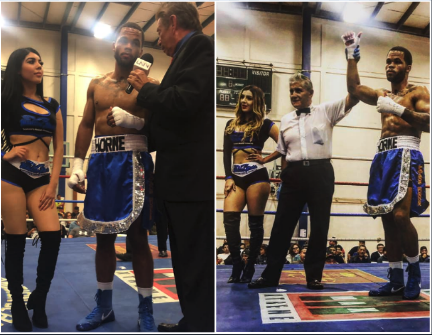 After what has to be one intriguing story, Horne, who now trains in Tijuana after moving there from Staten Island, N.Y., evened his record at 1-1, while his opponent Manriquez registered his 12 straight loss, 11 by knockout. 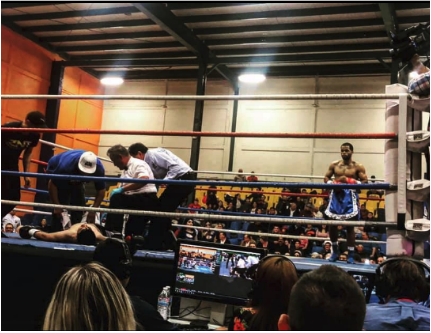 After his brief .41 second encounter, veteran sportscaster Fernando Paramo (l) of LATV couldn’t wait to get up in the ring and get Desmond Horne’s candid, straightforward, uncomplicated reaction. In Bout #6, 22-year-old southpaw, 5’7″ tall, lightweight Mike “Danny” Sanchez 131 lbs. 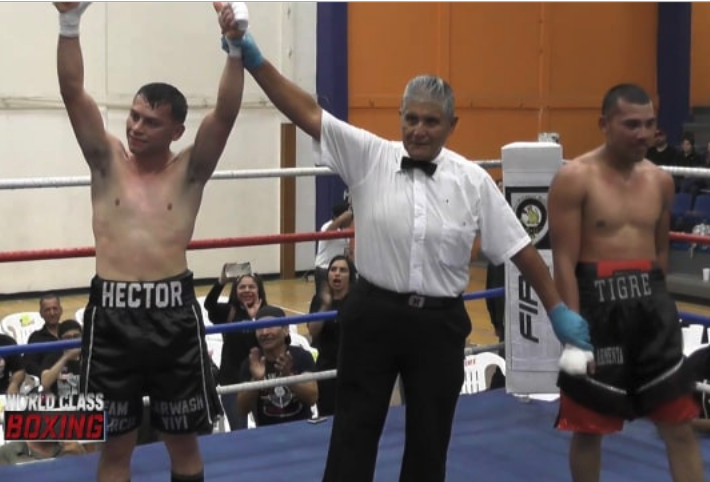 (now 4-0, 2 KOs, Global ID 831210) from Colton, Calif. made quick work of the 130 lb. 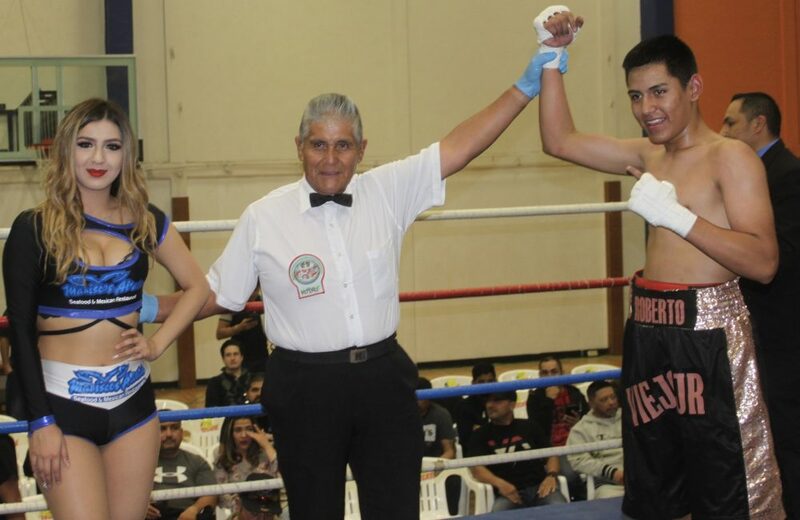 debutant Miguel Angel Orozco Global ID 876327 (now 0-1) from Nacozari, Sonora, Mexico. In Bout #7, it was 20-year-old welterweight Honorio “Jr.” Hernandez Global ID 775088 from Playas de Rosarito, B. C., Mexico now (8-1, 6 KOs, 144 lbs.) 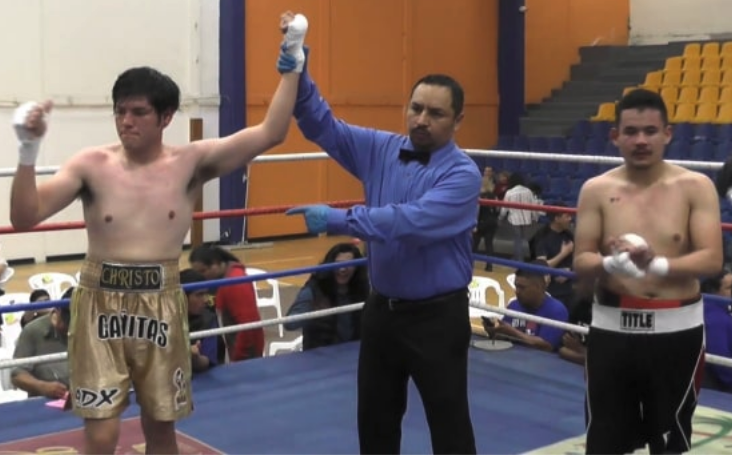 looking quite impressive in his 1st round, (0:59 second) stoppage of 20-year-old Emir “Chester” Montano now (2-5), Global ID 603691 from Agua Prieta, Sonora, Mexico . In Bout #8, it was 6’4″ tall Matt McKinney Global ID 665387 (now 6-3-2, 3 KOs), an understudy of former super welterweight standout Danny “Dynamite” Perez at the Art of Eight Training Center in San Diego, registering the early .21 second, first round stoppage of the 38-year-old Esteban “King Kong” Sosa Vazquez Global ID 474100 (now 2-17, a victim of 14 KOs) who lives in Tijuana. 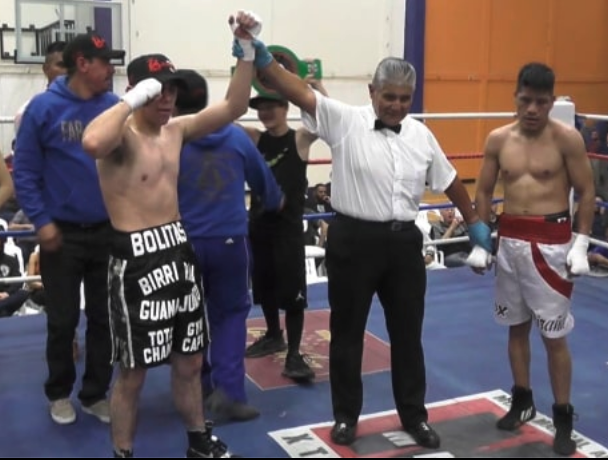 Bout #9 was a six round welterweight match between 23-year-old Raul “Borrego” Gomez Galvez, Global ID 867248, record 1-0, 1 KO, from Playas de Rosarito, B. C., Mexico facing Samir Roman Global ID 872544 also from Rosarito who was making his Pro Debut. Both men, Gomez (left) and Roman (right) weighed the very same 146½ lbs. In this one, Gomez had far more confidence than Roman and it showed as he went to work early as if he had a pressing dinner appointment with the wife. The end, a TKO victory of Roman, came early at the 2:48 mark of round number one. Rumor has it, this celebrating routine could end up being a habit. 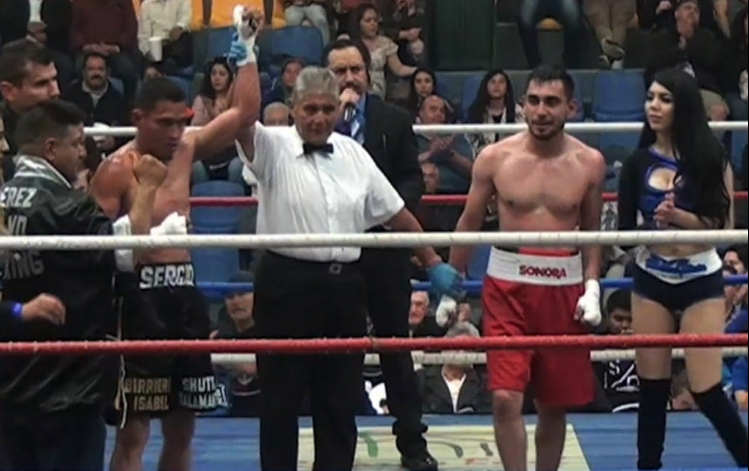 At the conclusion of Bout #10, we saw the referee raising the arm of the victorious 24-year-old lightweight (131 lbs.) Diego “FlaKO” Aleman who hails from Rosarito, B. C., Calif. (Global ID 792224). 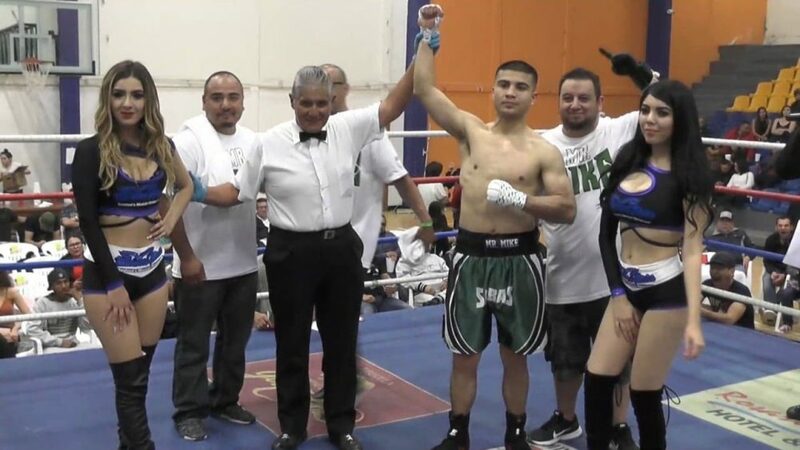 With Aleman’s 2nd round KO victory, he improved his record to 9-0-1, 7 KOs. The 21-year-old Oscar Ibarra (Global ID 564427) a super lightweight weighing 136 lbs. 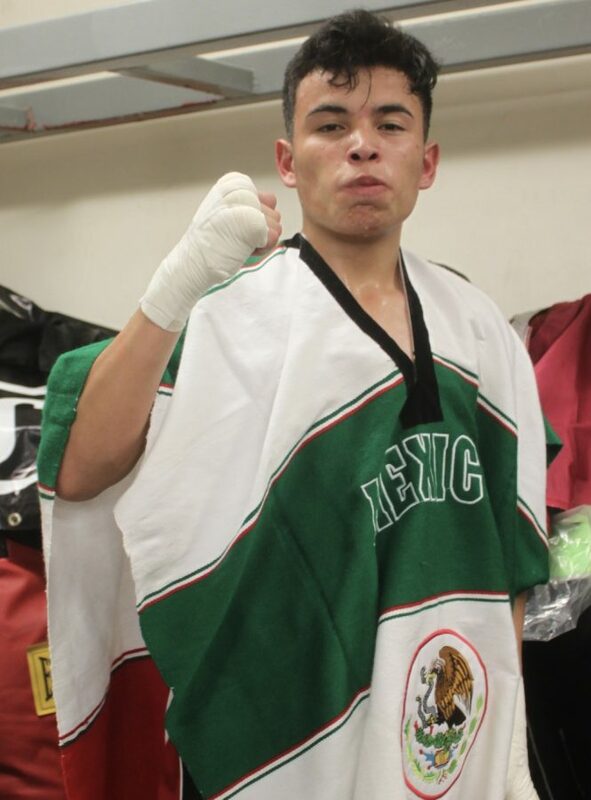 is from Los Mochis, Sinaloa, Mexico and with his loss, Ibarra’s record drops to 3-5-1, 1 KO. 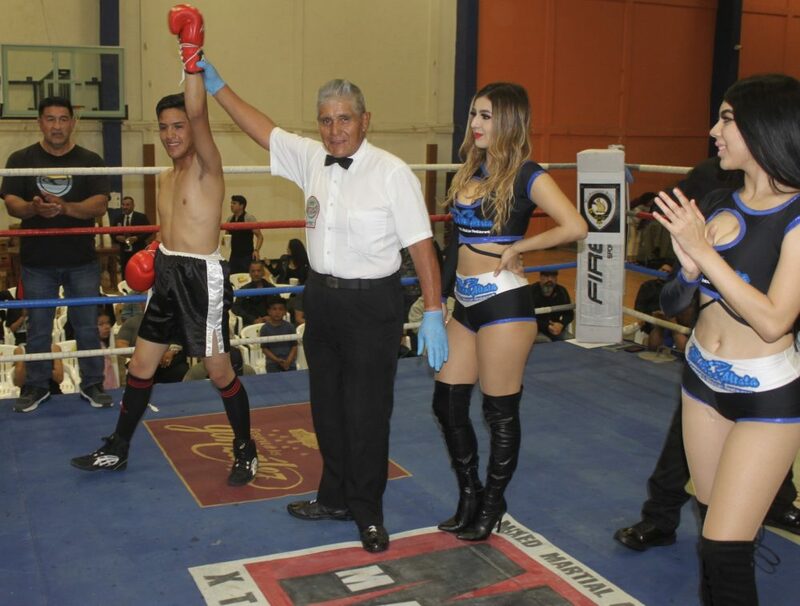 At the conclusion of Bout #11, we see veteran referee Juan Manuel Ricon raising the arm of the victorious, 22-year-old featherweight Jesus “Bolitas” Delgado (l), now 17-1-1, 10 KOs (Global ID 661890) who won a decided victory over the 33-year-old Victoriano “Piranha” Nunez (Global ID 325943, record 12-39-5, 4 KOs). It’s certainly great having these two gentlmen in your corner. 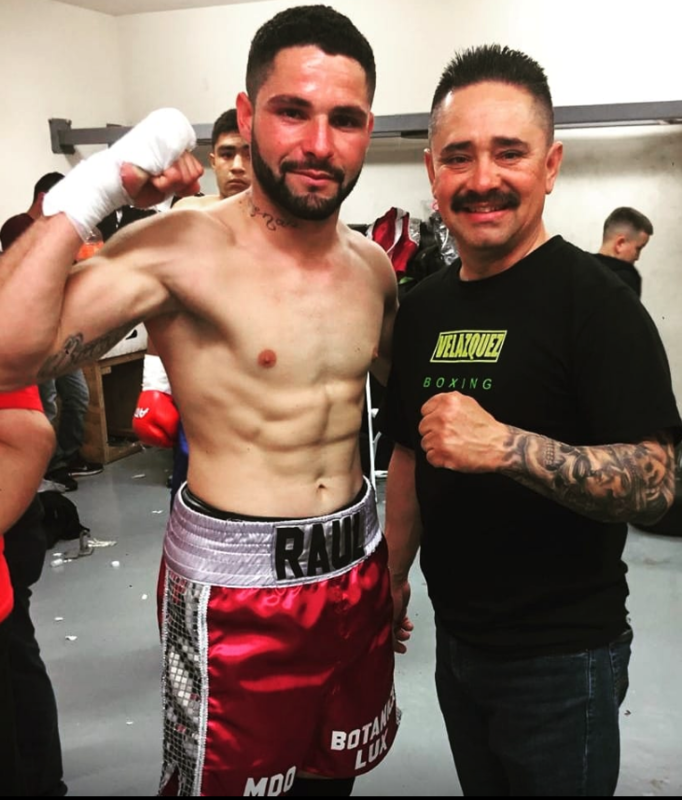 Jesus Delgado (c) registered win #17 with a little help from the incomparable Gabriel “Capy” Ramirez (l) and Delgado’s trainer of record Alfonso Martinez (r). Bout #12 was an extremely close super welterweight match, between the grizzled veteran Adan Gamboa Global ID 369155, 3-23-0, 2 KOs, who weighed in at 155 lbs.) from Tijuana and the 29-year-old Miguel “Zurdo” Sanchez (Global ID 646783, 14-2-1, who weighed in at 153 lbs., a pound under the super welterweight limit of 154) from Culliacan, Sinaloa, Mexico. Pre-fight there were some issues concerning that weight and the number of rounds, whether they were scheduled to go four or six rounds. After this exciting match played out and went the entire four rounds, all three judges had Adan Gamboa winning a 39-37 victory. 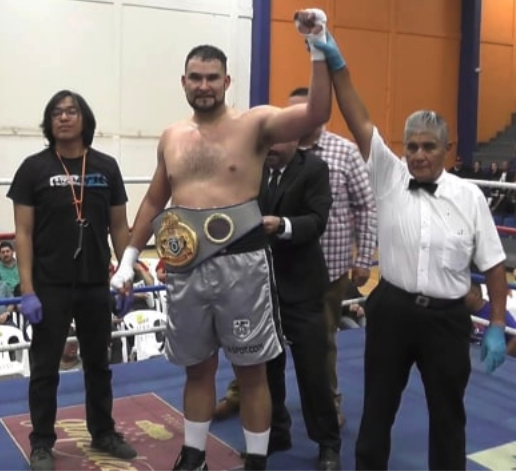 In Bout #13, the first couple of full-throttle punches from the 240 pound heavyweight Rafael Rios Global ID 694474 from San Diego, Calif. had the 264 pound Misael “Mimoso” Sanchez Global ID 729367 heading on a downward spiral. Then came this right upper cut that eventually had Sanchez falling through the ropes and into the arms of Frank Toscano the representative who was there to present the winner the Championship Belt. At this point, Misael Sanchez was sitting on the bottom rope unconcious. It was only a matter of time before he began to fall back and through the ropes. Fortunately, there was a concerned official there to break his fall. 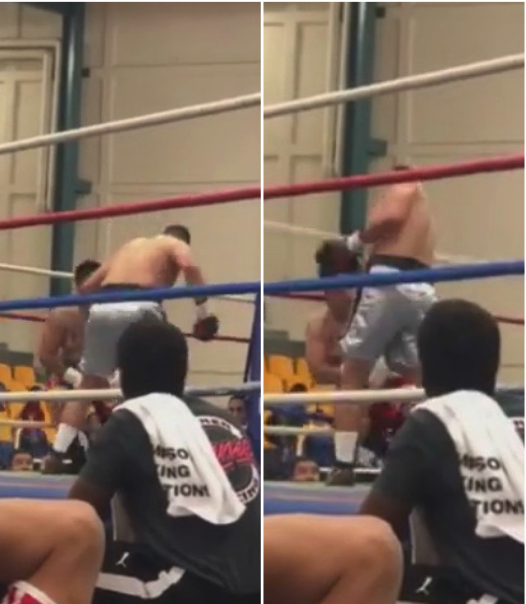 Sanchez from Tijuana, Global ID 729367, took four solid blows before going down. After the stoppage, Rafael Rios had his arm raised in victory by referee Juan Manuel Rincon. With the win, Rios moves up to (7-2 with 5 KOs) while Sanchez now drops to 11-12-6, 5 KOs. 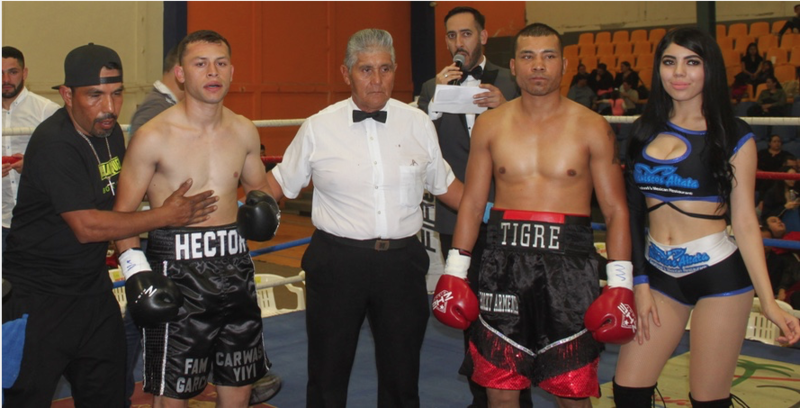 In the Main Event of the evening, Bout #14, they had Hector “Guadana” Garcia of Tijuana, 131 lbs., Global ID 668201, record 13-7-2, 8 KOs (left) facing the always tough 31-year-old Ivan “Tiger” Chavela 136 lbs., Global ID 440289, record 5-36-0, 1 KO from Tijuana, B.C., Mexico. 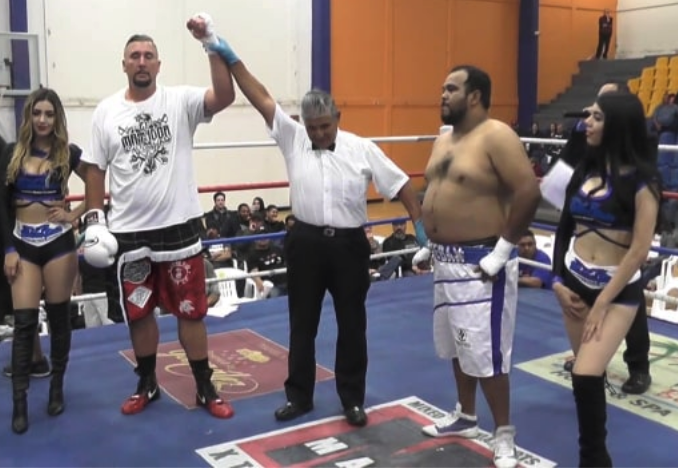 After what turned out to be a tough fight, Hector “Guadana” Garcia (l) came out victorious and registered his 14th victory by way of a unanimous decision over the gutsyIvan Chavela. 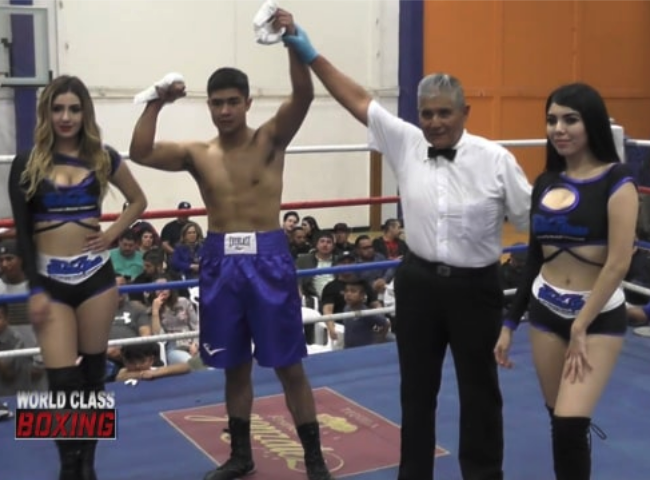 In Bout #15, it was 24 year-old Christopher Lozada (Global ID 845780) 153 lbs., from Rosarito, B. C., Mexico in his Professional debut giving 19-year-old Juan Manuel Valenzuela Palma Global ID 845780, 160 lbs., Record 0-1-0, from Agua Prieta, Sonora, Mexico a four round boxing lesson. 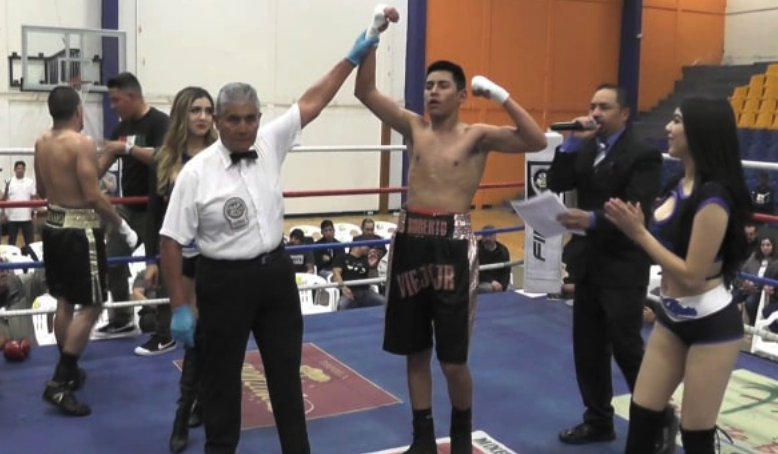 The son of the President of the Rosarito Boxing Commision was almost flawless as he went about delivering crisp blow after blow to earn the easy, third round TKO victory. Bout #16 a super welterweight match scheduled for four rounds featured the 34-year-old, 153 lb. ex-U. S. Marine, Donnis Reed from Lemon Grove, Calif., Global ID 788508, Record 3-2, 2 KOs going up against Alejandro Jose Nunez Rodriguez who was making his Pro Debut (No Global ID #). This bout turned out to be a real clunker. After considerable time feeling one another out, the six foot tall Reed began landing the more dominate blows which in time became lightning fast. As a result, Nunez became overwhelmed and began twisting and turning every which way possible while getting nailed. Soon one of Reed’s blows landed on the ear or possibly the backside of Nunez’s head and he immediately took a knee to plead his case that he was hit somewhere illegally and could not continue. Without the benefit of instant replay, neither the referee who was in position on the opposite side of the possible infraction or for that matter any of the judges could have added their opinion on the illegal blow to the back of the head or ruled in the favor of the bout being a NC, no contest. And the ultimate question, how could the boxer (Reed) ever be found at fault when it is the opponent, Nunez, who was the one who suddenly turned his head down and away at the very last second. 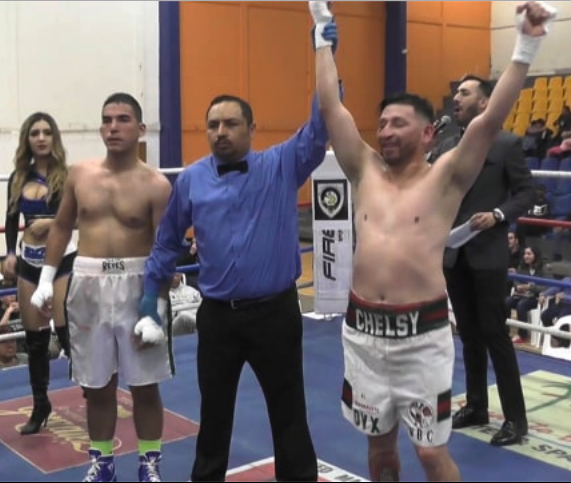 The referee had the two combatants in Bout #15, Donnis Reed (l) and Alejandro Jose Nunez Rodriguez (r) touch gloves to signify or perhaps sanctify his declaration the bout was ruled a No Contest.